Last Sunday I had 2 separate commitments with friends. Earlier the week before I ended up cancelling each of them. It had been a busy week, and I felt I needed to stay home and get some work done, and really, just spend time with my family. Then Sunday morning Seb woke up with a fever and that plan was also thrown out the window. Such is my life these days. I feel like I've been saying "I can't right now" to my friends so much lately. And for the most part, I'm ok with it. 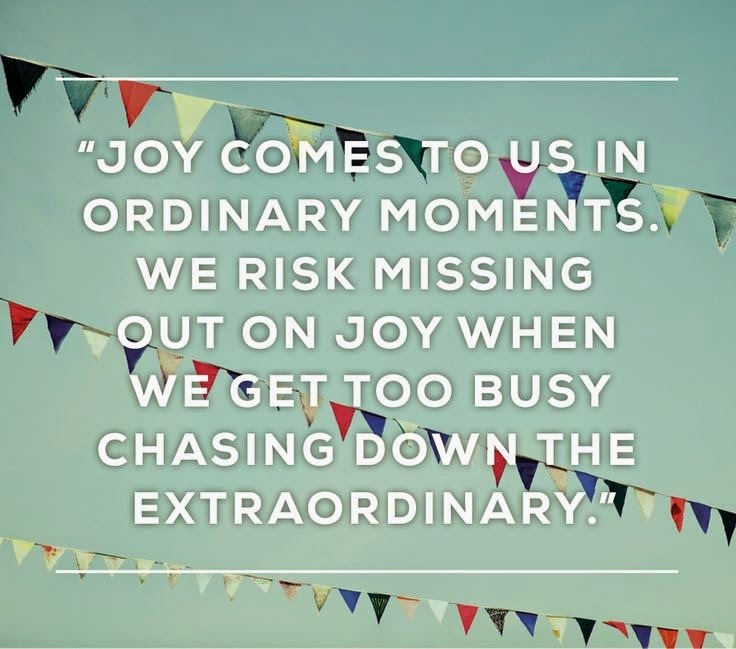 It's called the joy of missing out. This article describes the joy of missing out as, "a rebellion against saying yes to everything... about giving yourself the space to think and experience things without freaking out about what you 'should' be doing instead." Oh, how this speaks to me. I wasn't really feeling the 'fear of missing out' before. But if someone asked me to do something, and there was nothing planned in my agenda, I would usually say "Yes." and just make it work. What I've been learning this fall is that just because my Google calendar is free, doesn't mean my brain is. It makes me a better mom, wife, friend, and employee to make sure I'm not constantly running from one thing to another every minute of every day. I don't like saying no to my friends, and I feel even worse saying yes and then cancelling. But I'm not saying 'no' to do something I don't love. Sometimes I do really need to sit down and work for the job that pays me. But more often than not, I'm saying 'no' so I can spend some time with Rob and Seb. I know I joke about how batshit bananas parenting can be, but I wouldn't trade it for anything. The moments that are crazy are worth the moments full of joy, love, and laughter. We haven't made any permanent decisions, but it's quite possible that we may not have any more children, so I plan on enjoying the crap out of this one. Soccer on Saturday mornings, gingerbread cookie decorating on Sunday afternoons, a glass of wine and Netflix with my husband after a long week of work, these are the things I need more of in my life. As someone who loves lists and organizing, I found this quotation from Dr. James Dobson really resonated with me, "Children just don't fit into 'to do' lists very well. It takes time to be an effective parent when children are small. It takes time to introduce them to good books. It takes times to fly kites and play punch ball and put together jigsaw puzzles. It takes time to listen." So, when I have to RSVP no to something, it's not that I don't think it's going to be super fun or that I don't want to spend time with my friends. But I don't necessarily feel bad about saying no anymore. I both need and want to also spend time with my family, or even alone to recharge. I've realized that saying no to one thing allows me to say yes to another. Joy takes many forms. It can be a fun ladies' night out, a crazy vacation, a date night with my husband, or watching Seb make the puzzle pieces talk like animals. I feel blessed to be able to choose between so many paths to happiness and joy in my life. Even when it means choosing the ones that are closer to home.